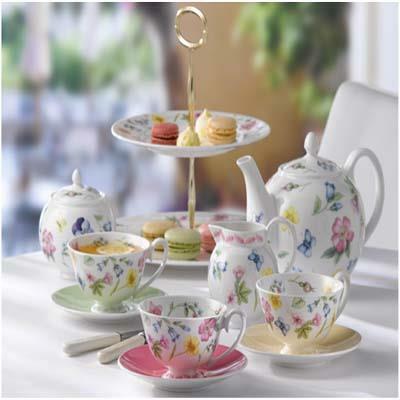 Fine bone china is well known for its delicacy and beauty. Coupled with signature tunes of summer a certain spirit of adventure is merged with traditional craftsmanship. Charlotte is a range of cheerful patterns with their floral motifs, multi-coloured spots and flares of nature that simply burst with energy. Imagine sipping an early morning tea or coffee to the freshness of meadow flowers , the waking of the sunrise and the opening of the cottage garden petals. A surreal appearance adds to the depth of colour with butterflies, and bluebells – you’ll do well not to taste and smell them as you sip away your afternoon tea.